When setting up an employer on BrightPay you will be asked for the "Benefit tax accounting method", i.e. 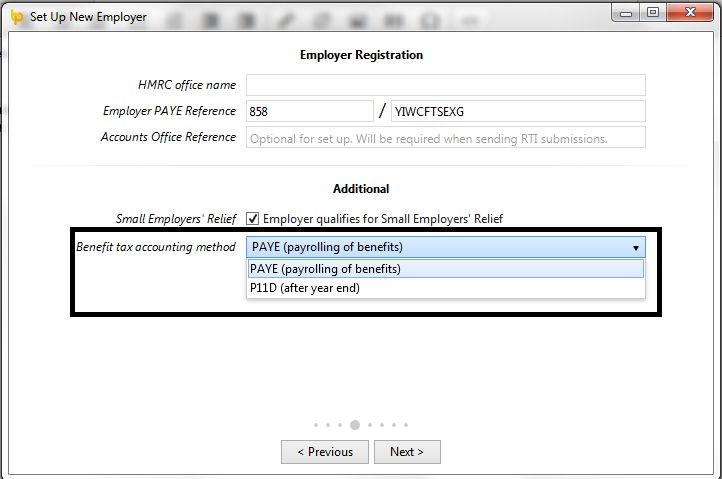 payrolling of benefits or P11D. The benefit tax accounting method selected for the employer is used as a default when adding expenses or benefits to an employee record, however the method can be changed for employees where applicable. The benefit tax accounting method can be viewed or amended any time by accessing the employer utility, selecting "edit employer details" and choosing registration details. Please note to payroll benefits for tax year 2017/18, you need to have registered to payroll using the new service by 5 April 2017. You won’t be able to register after this date for the 2017/18 tax year as HMRC can’t process changes in-year.